Mr. Monastyrsky noted the forthcoming 70th anniversary (September 29-30, 2011) of the Nazi slaughter of Jews at Babi Yar. JFU would participate in various commemorations of this tragic event, he said. He continued that 150 Holocaust massacre sites in Ukraine remain without commemorative monuments. Ihor Kolomoisky and Vadym Rabynovych of United Jewish Community of Ukraine have provided funding for some monuments, Mr. Monastyrsky commented, but other potential sources of support seem to have been “diverted” to the work of Father Patrick Desbois, whose major work lies in publishing accounts of the Holocaust in Ukraine. The written accounts are important, acknowledged Mr. Monastyrsky, but it also is crucial to preserve the killing grounds themselves and to appropriately memorialize those killed at each site. In response to a question, Mr. Monastyrsky said that the primary financial supporter of JFU is Oleg Grossman, a local businessman. Additional donors include other Jewish businessmen, and PrivatBank (Ihor Kolomoisky and Ihor Boholubov). The Joint Distribution Committee, the Jewish Agency, and several foreign governments and foreign foundations support specific programs. He is always seeking additional funds, he said. 79. 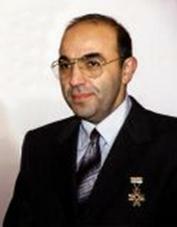 United Jewish Community of Ukraine was established as the All-Ukraine Jewish Congress in 1997 by controversial Ukrainian oligarch Vadym Rabynovych. Its current name was adopted in 1999. Mr. Rabynovych stepped down from formal responsibilities in 2008, naming Ihor Kolomoisky of Dnipropetrovsk as his successor. Its part-time executive director is Iosif Akselrud. According to Mr. Akselrud, the annual budget of UJCU is $3 million, almost all of which is provided by Mr. Kolomoisky and Mr. Rabynovych. Instead of operating its own programs, UJCU supports existing institutions, focusing on Jewish education. It subsidizes Jewish day schools and contributes 50 percent of the cost of a number of Sunday schools operated by the Jewish Agency. It also underwrites family Shabbatonim in which the Jewish Agency provides content. Additionally, UJCU supports the Hillel student group in Ukraine. Outside the education field, said Mr. Akselrud, UJCU contributes to the restoration and repair of old synagogues. 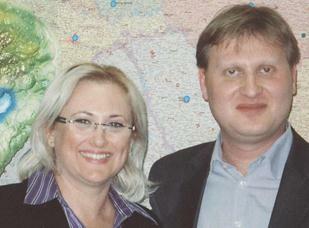 Vadym Rabynovych is in the photo at left and Ihor Kolomoisky appears in the photo at right. .ua/?mnu%20=25. Both retrieved on August 7, 2011. 80. The Jewish Agency for Israel (JAFI; Sochnut) operates a multi-faceted program focusing on Jewish identity-building and encouragement of aliyah (immigration to Israel). In common with other Jewish organizations, it has faced severe budgetary constraints during the past several years and has curtailed some programs while preserving others only by working collaboratively with other groups. The writer spoke with Bilana Shakhar, chief emissary of JAFI in Ukraine, and Idan Peisakhovich, aliyah emissary. Mr. Peisakhovich explained that JAFI maintains six representative offices in Ukraine and Moldova; about 230,000 individuals in the two countries are eligible for aliyah to Israel. Aliyah is increasing, he said; 1,533 left Ukraine and Moldova for Israel in 2009 and 1,701 in 2010. So far, he continued, aliyah in 2011 [as of April 3] is 13 percent ahead of 2010 and is expected to remain higher throughout the year. Aliyah is increasingly personalized, Mr. Peisakhovich stated, so as to ease absorption in Israel. Two of the most popular current programs are for physicians and computer specialists to fill specific positions in the Jewish state. These courses are highly structured, said Mr. Peisakhovich, and are very successful; most participants in these JAFI programs are between the ages of 27 and 35. Additionally, he continued, municipalities operate their own absorption programs, offering tax abatements and various other privileges for immigrants who elect to settle in their towns. Many towns, said Mr. Peisakhovich, sponsor “family adoption” programs in which a local family “adopts” an immigrant family and introduces them to local life. The adopting family will explain banking procedures, health plans, and other matters that are critical to successful absorption. Mr. Peisakhovich said that such relationships often deepen over time and are very helpful to new im-migrants. Bilana Shakhar and Idan Peisakhovich stand in front of a map of Ukraine in the JAFI Kyiv office. Israel programs for young people are in great demand. Three to four JAFI groups go on Taglit (birthright Israel) trips every year – and there is always a waiting list, said Ms. Shakhar. Most participants are from the city of Kyiv itself. Mr. Peisakhovich had just returned from a three-day seminar for future participants in Masa (intensive, often specific-interest program of at least five months) and Selah (10-month preparation for university/college in Israel); a total of 80 people attended - 40 future participants and one of his/her parents. Mr. Peisakhovich recalled that most of the families were poor and from small towns, such as Bila Tserkva (Belaya Tserkov) and Tulchyn. Most of the young people are not halachically Jewish and few are interested in learning about Judaism, Jewish history, or any other aspect of their Jewish heritage. Some are weak academically. Their primary interest in Masa or Selah is escaping the impoverishment of small Ukrainian towns and a hope for better economic circumstances in Israel. A recent Masa fair in Kyiv drew between 300 and 400 young people, Ms. Shakhar noted; most attendees were from Kyiv, but approximately 100 made their way to the Ukrainian capital from smaller cities. Ms. Shakhar stated that all Selah programs now are 10 months in duration; it was impossible, she said, for participants to achieve university-level Hebrew in the previous five-month course. The new Selah course is divided into two five-month components; the first five months consists of an intensive Hebrew ulpan (400+ hours of Hebrew), and the second five months includes less intensive Hebrew instruction, English, preparation for exams, and excursions around Israel. JAFI needs to strive for consistency, Ms. Shakhar continued, in aliyah preparation provided to people in smaller towns and large cities. People in the latter are better educated generally and have access to many more programs addressing Jewish identity, Jewish heritage, and Israel. Jews from small towns bring a weaker general education and are isolated from Jewish life. A series of Shabbaton seminars could be very helpful in bridging the gap, said Ms. Shakhar, but JAFI lacks the funds for such programs. She noted that JAFI even lacks funds to accommodate all young people who request places in JAFI summer camps. In response to a question, Ms. Shakhar said that JAFI also lacks financial support for the student clubs that it used to sponsor. The Jewish Agency continues to operate youth clubs, but these do not focus on students. Mr. Rabynovych is persona non grata in several Western countries. 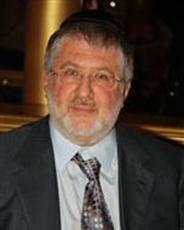 Mr. Kolomoisky spends most of his time in Geneva. Mr. Axelrud’s major employment is with Hillel. See pages 97-98. The number includes individuals defined as Jews under the Israeli Law of Return plus their non-Jewish first-degree relatives.